Will Ore. test project bring offshore wind to the West Coast? The offshore wind industry is finally showing signs of progress in the United States. The Department of the Interior completed its second offshore wind lease auction for acreage off the coast of Virginia in early September, and the nation's first grid-connected offshore wind turbine, a small prototype created by the University of Maine, started spinning off the Northeast coast this spring. But all of the proposed utility-scale offshore wind projects in the U.S. lie along the East Coast, raising the question: What about the West Coast? Why isn't the offshore wind industry eyeing California or Oregon, leaders among the renewable-energy-friendly states? The pioneering Hywind floating turbine produces power off of Norway. Photo courtesy of Statoil. Last week, an early sign of movement toward offshore wind energy development on the West Coast appeared in the Federal Register. The Interior Department issued a public notice that Seattle-based Principle Power Inc. has requested a commercial wind lease for a demonstration project in a 15-square-mile area of ocean near Coos Bay, Ore. (Greenwire, Sept. 30). At 30 megawatts, the proposed development is a demonstration facility, substantially smaller than the utility-scale projects planned on the East Coast. The Massachusetts and Rhode Island ocean acreage that Interior auctioned off in July has the potential to provide 3,500 MW of power. Offshore wind development on the West Coast isn't lagging because there's not enough wind blowing in from the Pacific Ocean. Waters off Northern California and southern Oregon have some of the greatest offshore wind resource potential of all the coastal U.S. states, with some areas seeing annual average wind speeds of more than 23 miles per hour, according to a map created by the National Renewable Energy Laboratory. The main challenge to offshore wind in the West lies deeper -- much deeper. "The reason that we haven't seen offshore wind on the West Coast is that, unlike the gentle slope of the outer continental shelf in the Atlantic, there is a huge ledge and drop-off in the Pacific where the shallow waters are too close to land to build utility-scale wind farms," said Jim Lanard, president of the Offshore Wind Development Coalition. Most commercial wind farms are built about 50 miles offshore in waters that are around 50 meters deep, to minimize both visibility and environmental and industry conflicts. But according to Christopher Romsos of Oregon State University's College of Earth Ocean and Atmospheric Science, water depths off the West Coast drop fairly rapidly around 20 miles offshore to depths of about 1.86 miles -- far too deep to pound in the monopiles that support traditional, fixed-bottom offshore wind turbines. "West Coast wind projects cannot use the same basic technology that is used on the East Coast," said Jason Busch, executive director of the Oregon Wave Energy Trust. Principle Power's proposed offshore wind project is therefore testing the feasibility of a relatively new technology: floating wind turbines. For the WindFloat Pacific Project, five semisubmersible units will gently bob in about 1,200 feet of water 16 nautical miles from Coos Bay, anchored to the bottom with mooring lines. "Floating technology provides an opportunity for the West Coast to develop its offshore wind resources," said Christopher Long, offshore wind and siting policy manager at the American Wind Energy Association. Long added that because Principle's design allows for most of the construction to take place on land (units are towed out to the site by boats), installation costs could be lower than with traditional offshore wind turbines. Due to the ocean depth, the price tag for the subsea cables needed to transmit power will be greater than with traditional offshore wind projects, said Kevin Banister, the WindFloat project manager, "but in terms of cost, the depth does not translate to a terribly big impact." Starting in 2011, Principle Power began testing a smaller, 2 MW version of this device off the coast of Portugal; although it was not the first large-scale floating wind power unit deployed (Norwegian oil giant Statoil ASA claimed this title with its 2.3 MW Hywind turbine in 2009), it was among the earliest examples of this technology in the world. "It's really taken some technical evolutions to get to a point where we have confidence where these floating structures are going to work," Banister said, but for Principle, the company's Portugal prototype has "proven that these floating structures work." Last year, Principle received a $4 million grant from the Department of Energy that will help fund the project, and it is one of seven candidates investigating offshore wind technologies that could qualify for an additional $47 million over the next four years. WindFloat is the only awardee located on the West Coast (ClimateWire, Dec. 17, 2012). Ultimately, Banister estimates that the Coos Bay project will cost about $200 million. International turbine manufacturers are similarly confident about the future viability of offshore wind. "Floating turbine technology will be commercially viable after 2020," said Uffe Vinther-Schou, senior vice president for Vestas' offshore operations. A recent study commissioned by the European Wind Energy Association found that floating offshore wind farms could potentially provide enough energy to meet the continent's power needs four times over (ClimateWire, Aug. 6). Partly in anticipation of the increasing importance of floating technology, Denmark's Vestas Wind Systems A/S and Japan's Mitsubishi Heavy Industries Ltd. last month combined their offshore wind operations into a joint venture. At first the new company will sell the existing Vestas V112 offshore turbine with a 3 MW capacity, then it will complete development on and start selling the V164 8 MW turbine, which will be the biggest offshore turbine when a prototype is installed next year. Initially, the turbines are aimed at the North Sea, currently the only significant offshore market in the world. But the two companies expect the business to eventually expand to other areas of the world, including Japan and the United States. Japan's movement away from nuclear energy following the Fukushima Daiichi disaster in 2011 spurred the country to create an aggressive feed-in tariff for renewables (ClimateWire, Sept. 25). But like the U.S. West Coast, Japan also has a steep seabed off its shoreline, limiting the nation's ability to use conventional offshore turbines. Mitsubishi was attracted to Vestas not just for its turbine technology but also for its floating technology, which the Danish company is currently testing with a 2 MW turbine floating on waters off the coast of Portugal in cooperation with local utility EDP. 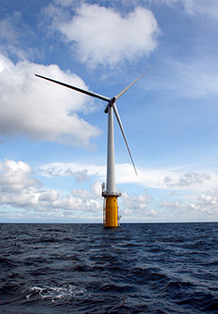 Mitsubishi is among developers erecting a 16 MW pilot floating wind farm off the Fukushima coast. The first tests are scheduled for August next year, and three turbines are due to be installed by March 2016. Japan's trade ministry has set aside as much as 12.5 billion yen ($130 million) to fund the early part of the study and aims for offshore wind capacity to be expanded to 1,000 MW in the area. Banister said that Oregon and Northern California, with their "world class" winds, will likely be a target market for Principle Power in the future. However, because Asia and the European Union are farther ahead with policy provisions supporting offshore wind, he saw more selling potential overseas. Representatives for Vestas agreed, saying the U.S. offshore market still has a long way to go before it can compete with Asia and Europe -- on both coasts. "The truth is that there are other markets all over the world that are a little further ahead," Banister said. Because floating offshore wind -- and offshore wind in general -- is new to the United States, it is harder to finance utility-scale projects, especially on the West Coast. "The perceived technical risk makes the return expectations higher for the capital that's being used to build the project," Banister said. "There will need to be affirmative policies to move the industry along." In terms of government policies supporting offshore wind, "the West Coast is not there yet, and we wouldn't expect them to be because there's not commercially available technology to do it at this time," said the Offshore Wind Development Coalition's Lanard. Offshore wind on the West Coast will also have to stack up against other, more well-established renewable energy technologies. Oregon hosts one of the biggest onshore wind farms in the United States, Shepherds Flat Wind Farm, with an installed capacity of 845 MW. Simply because there are more people living on the East Coast and less room to build onshore wind projects, there is greater potential demand for offshore power in states like New Jersey and Virginia, making policymakers there more willing to support it. "We're so densely populated here in the East that too much land-based wind farms are not that practical," Lanard said. "There's huge transmission congestion, which makes it much easier to bring the electricity from the ocean to the land." Additionally, about 40 percent of Oregon's net electricity generation comes from renewable hydroelectric power, according to the Energy Information Administration, making it one of the top hydropower users in the nation. Hydroelectric dams have allowed power in Oregon to be cheaper than on the East Coast. This makes potentially higher initial electricity prices due to the substantial startup costs of offshore wind less attractive. Oregon residential customers currently pay only about 10 cents per kilowatt-hour, while New Jersey customers pay more than 16 cents per kWh. But the location of Oregon's major dams and other power sources could provide an opening for offshore wind and wave technologies there. According to a state Department of Energy document, Oregon's electricity travels from east to west, and transmission lines operated by the Bonneville Power Administration are the only power lines that cross the state's Coast mountain range. Because of this, "the coastal grid is highly constrained; it cannot accept large new loads," the Oregon Department of Energy document states. "Currently, it is difficult to attract new industries to the coast without investing in and siting costly electric infrastructure to bring more power from east to west, especially for the southern Oregon coast." According to Busch of the Oregon Wave Energy Trust, this is where the potential demand for wind and wave energy comes in. "If we could bring generation in on the west side of the range, then you can fix this problem -- essentially balance the grid by putting power on the west side. It takes the pressure off of the transmission system and improves the quality of the power." Despite the fact that offshore wind on the East Coast has a physical, political and economic advantage, Lanard believes the West Coast has the potential to catch up when floating offshore wind technology becomes cheaper and available at utility scale. "I think by the time the West Coast is ready -- it takes years to get these policies in place and move forward -- I think we're going to have very competitive electricity prices with offshore wind on the West Coast," Lanard said. "Probably with less time than it took on the East Coast, because the East Coast started earlier and the technology on the West Coast is starting with a five-year head start." Correction: An earlier version of the story misstated the proportion of Oregon's net electricity generation that comes from renewable hydroelectric power. The correct amount is 40 percent.